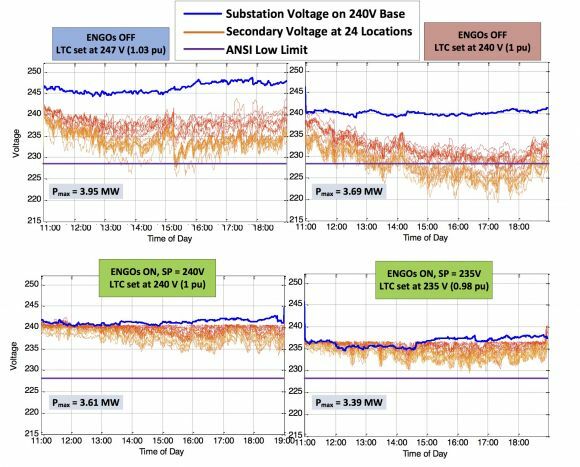 We’ve been tracking the emergence of a new class of grid power electronics -- devices that promise more flexible and fine-tuned control over distribution grid voltage profiles. GTM Research projects the U.S. market for systems like these will reach $320 million in 2017, driven by the need to monitor, manage and optimize the increasingly solar-rich and unpredictable edge of the power grid. Putting these devices to test in the field is a critical step for reaching this new market, of course. It’s even more important given the novelty of these power electronics devices -- and the different approaches being taken by individual companies in the field. Take some of the results coming out of utility pilots from two companies -- San Jose, Calif.-based Varentec and Woburn, Mass.-based Gridco. Last week, we highlighted how Gridco’s series-connected voltage control power regulation devices were able to keep voltages rock-solid on individual secondary circuits in ways that smart inverters or other reactive power compensation systems could find hard to replicate. This week, we take a look at the latest results from Varentec’s utility pilots. As of this month, the Khosla Ventures- and Bill Gates-backed startup has shipped about 450 of its Edge of Network Grid Optimization (ENGO) devices to 15 utilities, Deepak Divan, Varentec’s co-founder and CTO, told me last week at the ARPA-E Energy Innovation Summit. A few of those utilities, including Southern Co.’s Georgia Power subsidiary, has deployed as many as 100 of Varentec’s shunt-connected, reactive power injection-based devices on a single feeder -- and that mass deployment has led to some interesting and unforeseen results, he said. But first, let’s start with the fundamental problem of keeping voltages stable and managing reactive power (VAR) flows on distribution circuits. Volts and VARs are two key levers available to utilities to reduce wasted voltage, manage peak power demands, avoid overloading circuits, and manage voltage fluctuations caused by rooftop PV and other customer-sited generation, Divan noted. Traditional volt/VAR optimization (VVO) and conservation voltage reduction (CVR) systems use devices like load tap changers and capacitor banks, located at substations and primary feeders, to reduce voltages across the secondary circuits they feed with power. 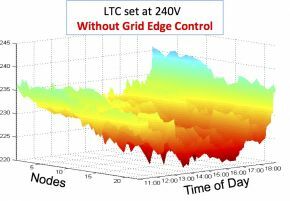 But voltage drop across distribution transformers causes unanticipated volatility at the grid edge, reducing the range of voltage control by primary assets. In addition, problem feeders -- say, long rural circuits with voltages that tend to fall well below system averages, or circuits with lots of solar PV, which can cause voltages to rise and fall with the passage of sun and clouds -- need to be managed as well. Varentec’s shunt-connected devices, by contrast, can be deployed on these problem feeders or nodes, to raise their voltages, as well as to dynamically flatten the overall feeder voltage profile, allowing central systems to push overall voltages lower, he said. Here’s a slide that shows how Varentec’s devices were able to bring one feeder that was previously experiencing lower-bound voltage violations into a much tighter voltage range over the course of a single day. Taking care of these low-voltage problem feeders, in turn, can squeeze roughly two to three times as much energy savings out of a typical CVR scheme than is possible with central controls alone, he said. Here’s a graph that shows how Varentec’s devices realized a 5 percent voltage reduction while keeping all endpoints within low-voltage limits, effectively increasing the overall system’s capabilities from the 1.5 percent to 2 percent energy savings possible with centralized controls. But some of the most interesting results from Varentec’s trials pertained not to individual circuits, but the system at large, Divan said. In particular, “we have shown that our solution provides voltage and VAR control on the secondary side at the connected node, as well as at other points on the feeder, even where the ENGO devices are not connected,” meaning system-level improvements are being realized automatically without any orchestration from Varentec’s control software. “We could have done one unit here, one unit there -- but we would not have validated what we’re seeing at the system level” with tens or hundreds of devices deployed, he said. That’s because Varentec’s devices work together to improve the voltage profile, not just at the connected node, but evenly across the entire feeder, he said. In simple terms, as more ENGO devices are added to the secondary feeders connected to a primary distribution circuit, “the system automatically self-balances to the point where the primary voltage becomes equal to the secondary setpoint,” he said. That’s a distinct operation from controlling voltage through a series-connected device like Gridco has demonstrated in utility pilots, which may improve voltage control at one specific node, but can also degrade the voltage at other nodes on the feeder, he added. The technology’s self-balancing capabilities “also allow us to operate the feeder with a controlled power factor,” Divan said -- another useful and hard-to-manage feature of value to utilities. The technical reasons for this effect are complex, and not easily conveyed in chart form, although GTM Research did cover the topic in its latest webinar on grid power electronics, he said. Adding the ability to control each ENGO device as an individual unit or in aggregate opens up more uses, such as managing solar PV’s effects on individual circuits without sacrificing overall grid stability and VVO benefits, he said. That’s not to mention the sensor and data collection capabilities that come with networked devices stationed at key points in the grid. Solar inverters themselves can inject reactive power much like Varentec’s devices do, and many utilities are working on putting such “smart inverter” capabilities to use. “These could be a part of the ecosystem, and they should be,” Divan said. 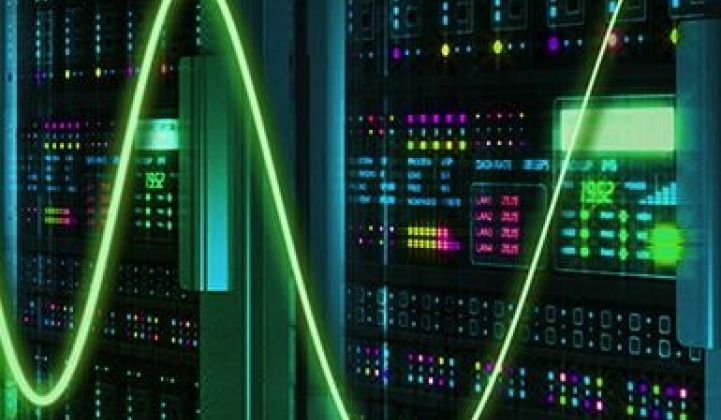 “But utilities have to manage their own volt/VARs -- and we have mastered the art of controlling these hundreds of devices on individual feeders,” he said. That includes a patent-pending approach that surmounts the problems that can come when individual, autonomous devices “fight each other” on the grid, he said. 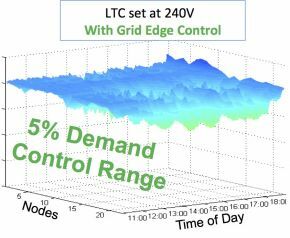 In that way, Varentec’s devices deployed en masse could become a single point of control for grid operators starting to become overwhelmed by the complexity of distributed control, he noted. “The key element of Varentec is not just the device, but the discovery of how to deploy a set number of devices on a feeder, at the right locations, and achieve a completely balanced overall feeder,” he said. Stay tuned for more results to illustrate how this vision could become part of utility toolkits for managing the grid edge.